Enjoy a game of football at L'Oceano d'Or. The waterslides at L'Oceano d'Or will keep the children happy all holiday. You'll be pleased to hear there's a beach close to L'Oceano d'Or. Want to have a closer look at L'Oceano d'Or? 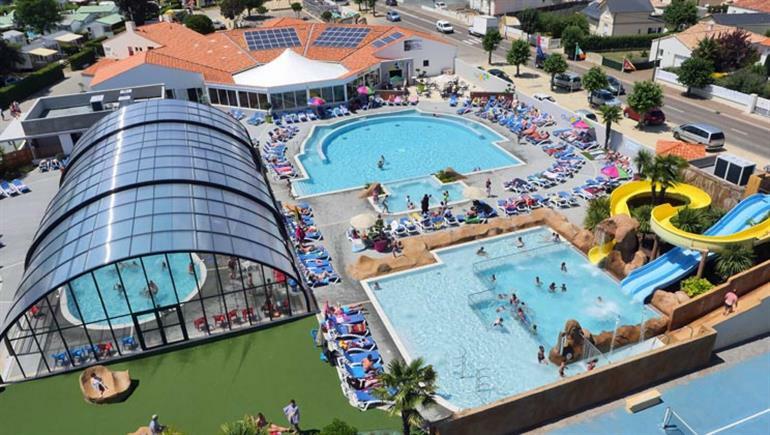 If you think L'Oceano d'Or in Jard sur Mer, Vendee is the holiday park you, why not have a closer look, and check out prices and availability. L'Oceano d'Or family holiday park has 450 pitches. Eurocamp have family holidays parks all around Europe. 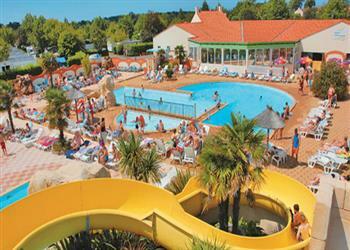 L'Oceano d'Or (VS013) is just one of the family holiday parks in Jard sur Mer, Vendee, France. Have a look for other holiday parks in France. You can also see what other people though with the reviews of L'Oceano d'Or. These are the reviews for L'Oceano d'Or. There are 40 reviews. We use the park location as a centre from which to visit the local beaches, jard itself, indian forest, puy du fou and the cycle vendee path network. The young one in the party likes the pool on site. We experienced one of the worst storms we have ever encountered whilst in france and we had a lot of rain. The site was fortunately well drained. Enjoyable holiday. Very good location for beach. Nice visits to towns on either side of the coast 20-30 min drive. Several close attractions for younger children. Excellent swimming pool area for the 3-12 yrs age group. Courier was good and accommodation was reasonable for our needs. Hypermarket nearby. This site is quite tightly packed compared to other eurocamp sites. 6 hour drive from calais with excellent roads. For the price we paid we were satisfied. A good choice if you have younger children. Excellent holiday again, accommodation at chateau des ormes was bit old and tired looking and was not to impressed with the cleanliness but other sites were fantastic. . special thank you to penny at jard-sur-mer, she was very good, welcoming and extremely helpful all week..always had a smile on her face. Good parc if the weathers ok, nota lot to do if it is not, very good entertainment on an evening even though they cater mainly for the french, still very good. Accommodation quite dated though serviceable, only 1 courier on site (pennie) she couldn't do enough too help especially the grand children. Excellent base for visiting the vendee.the new indoor swimming pool is good. We enjoyed the quietness of the pitch having endured the excessive night time noise from the club last year. We surf so the closeness of surfing beaches is a plus. We eat out each night and jard is well served by restaurants and bars. . all in all a great holiday. One of the worst holiday in my life.we booked 1 week holiday with ferry from caen to l'océano d'or, jard-sur-mer by car takes 4.30 hours eurocamp didn't tell as we have to drive 4 and half hours. When we arrived there 10 in the evening hopping for a good night sleep we had to clean the mobile home for 45 minuets the next night 7-8 people arrived next door to as with 4 teenagers drinking and parting to 2-3 in the morning the next day they star it drinking and swearing from 1 pm any way to cut it short we had to leave the 3rd day and stay in a hotel for the rest of the week cast as another 1200 pounds.i could wright a full book about this tree days it was bad experience. Newer book holiday with eurocamp again. . .
Our holiday was great. The area is beautiful, the beach is stunning and jard sur mer is a convenient little place with a very good super u and some nice marina located restaurants. The espirit 3 bed is perfect for a family of 5 however in this park the accommodation is pretty tightly packed, probably the closest we have had compared to 3 other eurocamp parks we've been to which was the only downside. Not great hearing normal talking level conversations clearly from two others units that were both within a couple of metres of ours. The park itself is clean and the pools are fun however don't expect the lifeguards to be any good as unsupervised teenagers were causing havoc in the pools however instead of tackling them they'd hoist people out of the water who were wearing shorts. We had a good time here as we were there with friends. However I was very disappointed with the site, the mobile home and the couriers. . . the site is never a 5 star site. It is shabby, a bit run down and not v well maintained. There was even poo in all over the floor in the pool loo one day. . . I appreciate we booked a "classic" as this was the only availbility. However we still paid over £1000 for the week and the van was very old. Showers were cramped, water ran hot then cold, was difficult to get it right, emplacement was in a terrible location. . . when I let the couriers know I wasn't unhappy with them but with the level of accommodation, they were rather direct and agressive in their approach. On leaving at the end of the week they were more interested in making sure that we cleaned everything: oven, barbecue, fridge..rather than whether we had a good time. One minor small point, we didn't have a welcome bottle of wine! . . I found the holiday on the whole was not good value for money at all. Next year we are looking at booking directly with campsites where we believe we can get a better level of accommodation . Wonderful holiday park, eurocamp caravans interior looking tired and outdoor furniture too. desperately needs decking and newer caravans. The mattresses were awful to sleep on and they made all ache as we all felt like we were sleeping on boards. Not a parc we will return to. The accommodation was excellent and the couriers were very helpful. However, we were disappointed with the pool as there was a very small toddlers pool with only one slide & that was it! the big slides were too fast for our 3 yr old, and there was barely any shade. Also we expected to be within walking distance of the beach, but it was a bit far really & easier to take car. What not to like. The weather was fantastic, the local beaches are fantastic. Jard sur mer is a pleasant town with plenty to offer. The local area lends itself to exploration. Lovely clean pool, in busy times needs more than one lifeguard though. Caravan was lovely and comfortable and positioned out the way as entertainment can be loud on several nights. Eldest children had a great time in parc but it is limited to what you can play on for little ones. Village is beautiful and a very short walk as is the beach. Worth driving a bit to find nicer beaches though. Would definitely go back. Had a very good time , holiday parc great , swimming pool ok .keycamp couriers excellent . would go again. We had a great time. There was plenty to do for the age range of our children. Camp very busy. The facilities were only average and there were no outdoor table tennis tables. It all looked a bit dated. A fantastic time! great weather, 3rd time at this great park! Fantastic park . . had a great holiday good location etc. It would benefit from a kids club, bigger pitches and cleaner accommodation. A very clean well managed site. Richard from keycamp was very friendly and imformative . I would recommend this site. The yellow flume was out of order for 2 days during the trip but the children enjoyed the holiday . Lovely campsite basic but has everything you need. The swimming pool was very cold! we had a 3 bed 2 bathroom home which was dated and needs new cooking equipment and new knives. The area around the caravan needs to be decked or a good sweep there was lots of leaves that had fallen in the previous autumn and we went in july and it just needed a general tidy up. The park is ideally positioned to be able to walk into town 10 mins walk, and harbour/beach/restaurants 15 mins away. the monday market is worth a visit. The brittany change of routes and times did not help and I feel the move to the current fleet, from poole via the barfleur was both more inconvenient and also a move down in quality. the parc was not too special, flitting in an out of electronic card access, and local french roadworks made travelling, at the beginning, rather awkward - fortunately, the local courier was fantastic. jard sur mer was pretty and very convenient - the parc less so.
. the holiday was great despite the weather being a mixed bag of glorious sunshine and torrential thunderstorms. The location lends itself to a relaxed stay with good old fashioned family beach fun on tap. if you're wanting theme parks, zoos and commercial thrills be prepared to travel, a lot! the area in general was "shut", this part of france doesn't open to tourists til july and shuts again in september. all in all, we had fun as we were prepared to make our own. Buckets and spades, football, walks in the woods. Just right! more jumpers needed than shorts and t shirts, but that's down to the environment and not the facilities or key camp. Really well sited near to the town and relatively close to the beach and port de plaisance. pretty place with a nice feel. good market on mondays. The area and the parc are lovely, it wsa clear though that it was not really season for the french as the shop and take away opening hours were any ones guess. Great pleace though and would certainly go back.